Wine Enthusiast’s bestselling coffee table has been taken to the next level- literally. 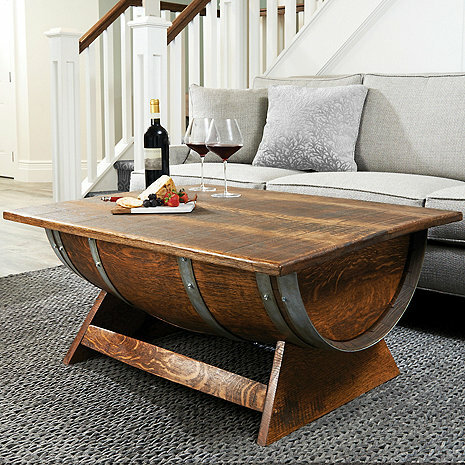 Our rustic, recycled wine barrel coffee table now meets modern convenience with a top that raises to double as a desktop or a comfortable spot for enjoying drinks and snacks. The lift-top opens to reveal ample storage for keeping items like pillows and blankets close at hand, yet out of sight. Handmade from a recycled oak wine barrel, featuring authentic barrel hoop hardware and barrel stave legs. Will it say wine enthusiast on the box/crate etc? WILL IT BE DARK AND SHINY LIKE IN PICTURE? for the most part mine matches what is shown in the picture. I don't notice mine being as shiny as the one shown in the photo, might just be the photo. It is slightly lighter color, like oak. Not as shiny, but I still love it! It is perfect size! I also love the lift top feature! It looks just like the picture! It is shiny like it’s just been seated and polished with a wood wax. I LOVE my table. It’s dark but not as shiny more rustic looking. We love ours! It’s not dark or shiny. If I personalized the wine barrel coffee table is it personalized on both sides? BEST ANSWER: Angelo, yes, both ends will be personalized. Thanks! How would we know? Though at least finally in transit. We ordered it 4 days before the cut off for orders to be able to arrive for Christmas. We had to call to get any status at all, as Christmas approached. The Wine Enthusiast never sent us an update after accepting our order, and the links for status weren't showing anything. In that call, the delivery would supposedly be just after the new year. Now it is 10 January, 2019....and only the crickets are making noise. This coffee table is the best! Love this piece, great character and compliments the feel in my tasting room! Awesome table...exactly what I wanted! The lift-top function makes it even better.